After consuming more wings in one weekend than anyone should in their lifetime, at Peppers at the Beach, we really wanted something different off the grill for dinner. 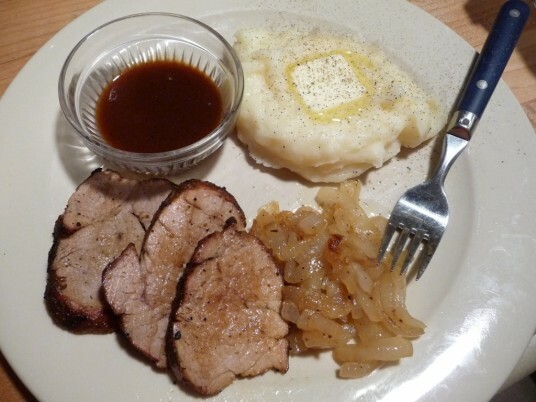 So we went with the extremely easy and versatile pork tenderloin. 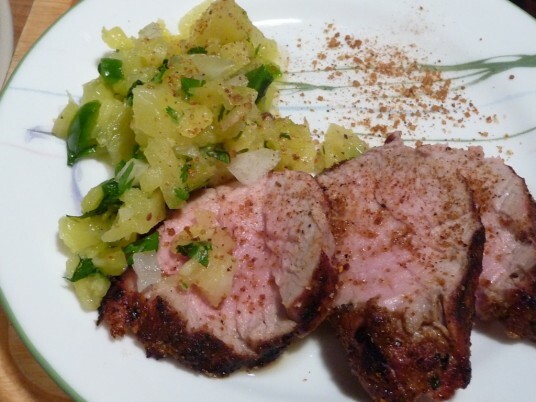 Featuring a heavy dose of Dizzy Pig’s Dizzy Dust rub, our tenderloin grilled up perfectly with a beautiful crust and was served with a quick Pineapple Salsa. The next night, leftovers were sliced medallions of the tenderloin with Patter Fam’s Jamaican Jerk Sauce for dipping, along with buttery mashed potatoes. The pork tenderloin is such a forgiving and versatile cut of meat – lending itself to marinating (think of your favorite italian dressing, or jerk sauce), rubbing (in this case with Dizzy Dust, or your favorite homemade or commercial rubs – slathered with mustard first, if you like that technique), coated with a fresh ginger and orange marmalade jam, or even brined or injected with a favorite vinegar/juice combo (that’s tenderloin 201 – advanced). Oh. And there’s jerked pork tenderloin… one of my favorites. More on that later. Marilyn was hanging out online with Shane Draper of Drapers BBQ, and I was looking at a blank canvas of the pork tenderloin, having already decided NOT to marinate it earlier. I asked her to ask Shane for ideas. He said, “rub the heck out of it, and grill it like a long pork chop. Rolling every few minutes to get a nice crust.” Thanks Shane. That’s exactly what we did. It was awesome. After sampling a few of the rubs here at the HotSauceDaily household, I zeroed in on the wonderful Dizzy Dust from Dizzy Pig. Sweet, savory, and a bit on the mild side, this useful rub has worked wonders for us on smoked turkey breast, chicken and now the pork. Dizzy Dust – ingredients: spices, turbinado sugar, paprika, salt, garlic and onion. (See where salt lies in the list? Near the end. You don’t need extra salt when rubbing pork). Now for a heavy dusting of the rub, getting it all over the meat and into the crevasses. I just knew Shane was right, and we would get a nice crust on this baby. I’ve always been a heavy hitter with rubs – sometimes over-doing it – but this was Dizzy Pig! Big flavor with low salt. Winner! Marilyn was our grill girl tonight (sorry Robyn), and after getting a good char over direct heat on her gasser, she moved it to indirect heat, shooting for 143º – 145ºF before pulling it off. After letting it rest for a few minutes, we sliced it up, and served it with our quick homemade pineapple salsa. A perfect, quick dinner. And I loved the crust and flavor from the Dizzy Dust. So much so, that I had NO sauce with it that first night. Very unusual for me, the sauce lover, to eat ANY meat alone – no sauce. 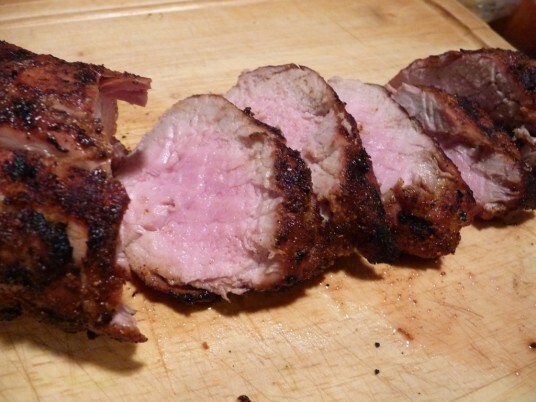 A testament to the great flavor of the rub and natural taste of the pork. Back to the jerk. No, not me… the sauce. I still had a hankering for some jerked pork. With more than a few jerk sauces and rubs around, I decided to try Patter Fam’s Jamaican Jerk Sauce, which we just scored at Peppers at the Beach last weekend. Patter Fam is well known in the chilehead circles as having high quality sauces and products. And while it is quite tasty, their Jamaican Jerk Sauce is not an authentic “jerk sauce”. It’s more of a “jerk flavored” sauce. Patter Fam Sauces Jamaican Jerk Sauce – ingredients: tomato concentrate, vinegar, water, onions, molasses, habanero peppers, cayenne pepper, ginger, brown sugar, lime juice, hydrolyzed soy protein, dextrose, salt, natural seasonings and spices. 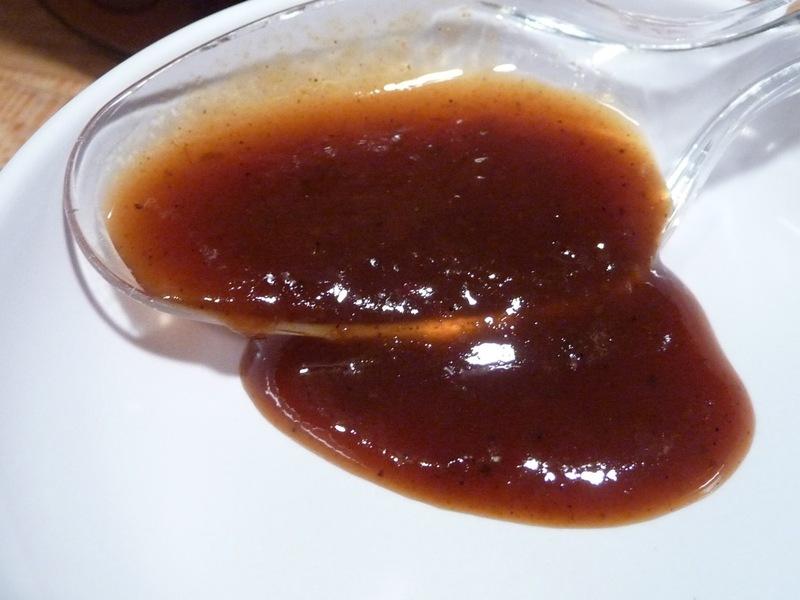 This moderately thin, dark brown sauce, at first taste brings on a bit of a worcestershire flavor – but with further tasting, it’s clearly a “steak sauce” base, with a hint of jerk. The habbys and cayenne peppers add their heat, and the molasses is the sweetener here, but it’s just not a true “jerk sauce”. There’s no allspice or smokiness to it. This would be the jerk flavored sauce you would introduce your timid friends to – not too hot, not too jerk. Having said all that, I can’t wait to try it on wings – when the statute of limitations has passed of course, after eating so many wings last weekend that is. You can visit Dizzy Pig BBQ for their Dizzy Dust. 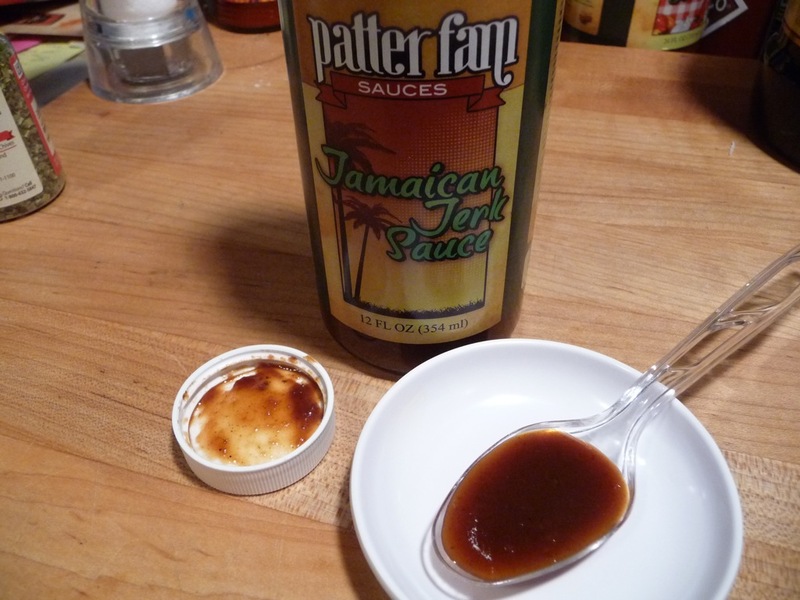 And visit Patter Fam Sauces to check out their Jamaican Jerk Sauce and other goodies. I do love me the jerk chicken. Go for it.